As we near the end of 2018 and enter the hectic holiday season I feel that reflecting on the accomplishments and changes that NENIC has made over the past year an inspiring task. We as a volunteer organization continue to bring our members services and opportunities that are valuable and for some rewarding. Early in 2018 we embarked on a membership drive that gave members the possibility of obtaining new members and in turn receive free one-year membership. This helped us grow our membership base and the hope is that those members in turn will participate in the many offerings that NENIC provides including free remote educational sessions. We hope to bring this opportunity back to our members again this year as well. We have embarked on a social media campaign, if you participated in Trends 2018 you know that we live tweeted during this event and it was well received. We plan to continue to Live tweet at all our future offerings so that we can garner some immediate feedback on content and give us more exposure to other like-minded folks. We hope to shortly expand our presence on LinkedIn so that our members will have another forum to obtain up to date information on happenings as well as exposure to Informatics content. There are some other items being reviewed that may enhance opportunities for our members to ask questions of our community so check back in frequently to see how things are moving. We have also added a journal club with the inaugural session being in November 2018. This session reviewed nursing dashboards. The event was well attended and offered CEU’s. Our program development group hopes to offer this online material up to 5 times a year with a generous partnership with the journal CIN: Computers, Informatics and Nursing. We hope that all of you take advantage of this opportunity to learn and share with your colleagues. As my term as President ends I look back and see all that this organization has accomplished and I feel a sense of pride both for what has been done but also for what is to come. I believe that we will continue to expand our digital presence in 2019 and beyond. I look forward to seeing both new colleagues and old acquaintances at many NENIC events and hope that you will join us. The NENIC Board wishes you peace and Joy during this Holiday season and a happy, healthy and educational New Year in 2019. Thank you for all of your support. NENIC is partnering with CIN: Computers, Informatics and Nursing and offering a virtual, on-line journal club. We are still in the planning stage but are targeting the inaugural meeting for November 19, 2018 at 5:30-6:30 pm (EST). Wilbanks, B. A., & Langford, P. A. (2014). A review of dashboards for data analytics in nursing. Computers, Informatics, Nursing: CIN, 32(11), 545–549. We are thrilled to announce that Primary Author Bryan A. Wilbanks PhD., DNP, CRNA will be joining us for the discussion. Marianne Kerr, CIN Publisher, has made the article available (above) at no charge for the months of November and December. Special thanks to Leslie H. Nicoll PhD, MBA, RN, FAAN, Heather Carter-Templeton PhD, RN-BC and Bryan A. Wilbanks PhD, DNP, CRNA for their support in this exciting initiative. There will be CE for this event for registered participants. Registration will open next Wednesday (11/14/2018). A link to join the discussion , on ZOOM, will be sent to you in a confirmation notice after you have registered. Registration required to receive your continuing education certificate. Beyond the EHR: What's Next for Nursing Informatics? This event was a complimentary to all NENIC members and you can join us in person or remotely. This program is a joint offering from NENIC and The Boston Children’s Hospital. Thank you for another great annual symposium this year! Trends in Clinical Informatics: A Nurse’s Perspective was a huge success, thanks to you! The day was filled with exciting speakers, insightful posters and great product updates from our sponsors. We also want to thank Partners Healthcare and The Children’s Hospital of Boston for their continued support. If you were unable to join us, you can find proceedings from the day in our innovation library . We will also be posting video recordings later this summer. 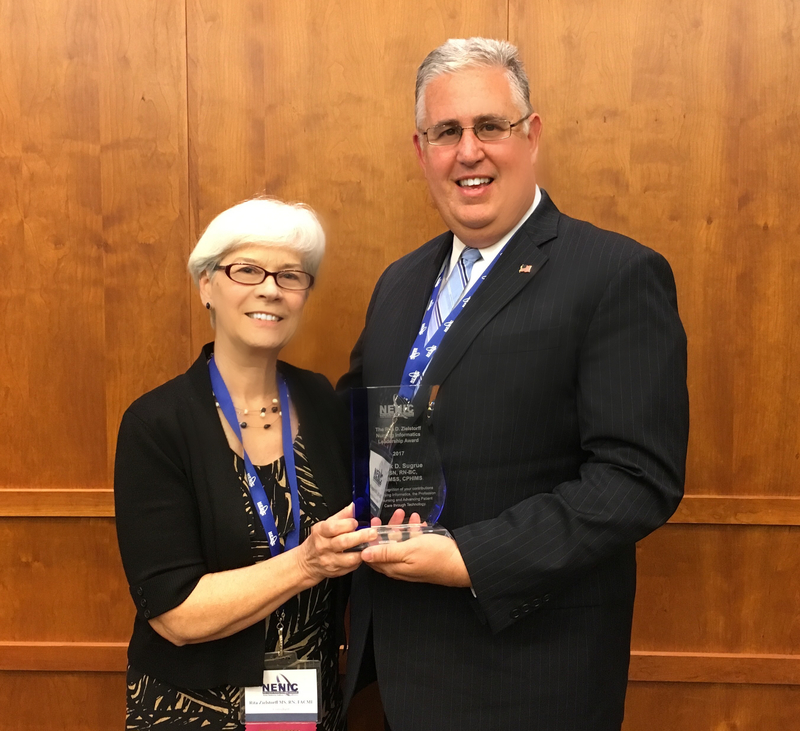 We want to congratulate the 2017 recipient of The Rita D. Zielstorff Nursing Informatics’ Leadership Award to Mr. Mark Sugrue MSN, RN-BC, FHIMSS, CPHIMS (CNIO, UMass Medical Center). Mr. Sugrue continues to be a beacon of leadership in our community and is well deserving of this prestigious award. We will be spending the summer months looking at how to improve our educational and development offerings as well as looking at how NENIC can better serve our community. If you have suggestions, please send them along! We would love to hear them. We hope that you all are having a wonderful summer. Special thanks to Mark Sugrue MSN, RN, FHIMSS, CPHIMS (CNIO, UMass Medical Center and ACNO of Professional Practice) who presented Driving Analytics to the Point of Care at our spring event. Mr. Sugrue also offered an update from HIMSS17 and Denise Goldsmith MS, MPH, RN, FAAN , AMIA NIWG chair, provided AMIA updates. We want to thank both Boston Children's Hospital , our Joint Provider partner , and Newton Wellesley for their support. Our 15th Annual Symposium (May 12, 2017) – Trends in Clinical Informatics: A Nursing Perspective is this Friday and we hope to see many of our members there! May 12th is also Nursing Informatics Day and Florence Nightingale's birthday. She would have been 197 years old. Happy Birthday to one of our greatest Nurse Scientists and Statisticians. This year’s keynote speaker will be Dr. Jane Englebright PhD, RN, CENP, FAAN who will share her insights on simplifying and standardizing clinical documentation to generate big data. In addition, Marcie Brostoff MS, RN, NE-BC (Boston Children’s Hospital), Sarah Collins, PhD, RN (Partners), Andrew Phillips PhD, RN (MGH-IHP) and others will also be providing updates on best practices and examples of nurses who are transforming patient care with informatics. Dr. Patricia Brennan, director of the National Library of Medicine, will be speaking at Boston College on March 27, 2017. Dean Susan Gennaro PhD, RN, FAAN has extended an invitation to the NENIC community so register soon and give Dr. Brennan a warm New England welcome! Register here. Thank you to all who attended our Fall Education and Development Program! The program was a great success with member participation from Massachusetts, New Hampshire, Rhode Island and Maine! Denise Goldsmith MS, MPH, RN, FAAN and I were able to offer a glimpse into the world of Nursing Clinical Decision Support: Governance,Life Cycle and Implementation at the Bedside. For those of you who were unable to attend, we will have a recording soon in our Members Only section. Continue to enjoy encore Trends presentations by Bonnie Westra PhD, RN, FAAN, FACMI on Big Data: Implications for Nursing Informatics and Joseph Kvedar M.D. on The Internet of Healthy Things. More highlights available in our Innovation Library and video for NENIC members. 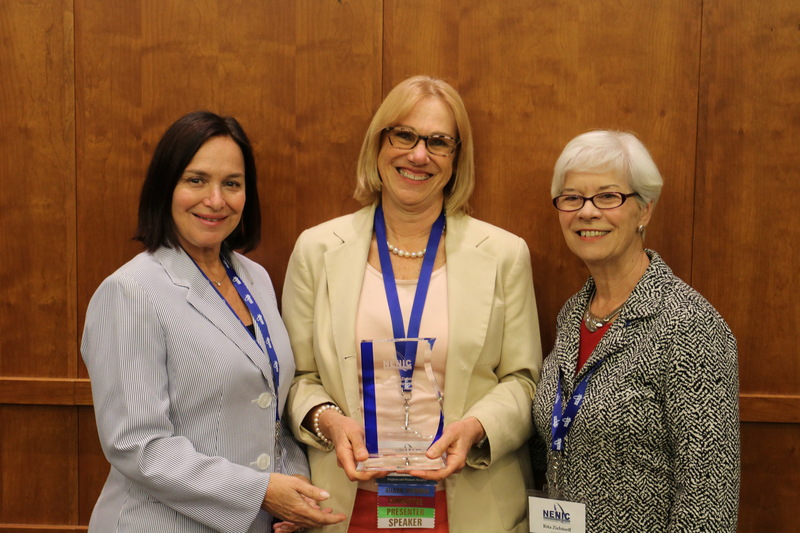 Congratulations to Mary K Kennedy MS, RN-BC, recipient of the 2016 Rita D. Zielstorff Nursing Informatics Leadership Award, in recognition of Mary’s contributions to Nursing Informatics, the Profession of Nursing and Advancing Patient Care through Technology. Congratulations to Denise M. Goldsmith, MS, RN, MPH, FAAN Chief Nursing Information Officer ( Brigham and Women's Hospital) has been nominated as a Fellow in the American Academy of Nursing , an organization of distinguished leaders in nursing who have been recognized for their outstanding contributions to the profession and to healthcare. Invitation to fellowship is a recognition of Denise's accomplishments within the nursing profession and includes a commitment to engage with health care leaders within and outside the nursing profession to transform America's health care system. Congratulations to Tiffany Kelly PhD, MBA, RN on her recent publication Electronic Records for Quality Nursing and Healthcare. Also congratulations to Virginia Saba EdD, RN, FAAN, FACMI and Kathleen McCormick PhD, RN, FAAN, FACMI, FHIMS, past NENIC presenters, on being awarded a Doody's Core Title (DCT) for 2016! The award honored the 6th edition of the Essentials of Nursing Informatics (McGraw-Hill). Lastly, please check out the August 2016 edition of CIN (Computers Informatics Nursing) Journal with member highlights from our 2016 Annual Symposium Member Highlights at 2016 NENIC Consortium's 2016 Symposium. In this study, the authors sought to understand the nature of requests for clinical decision support (CDS) interventions for nurses at a large hospital. Using requests from their hospital system and a literature review, the team identified high-priority areas for CDS conversion from paper forms. Their findings and approach suggest a mechanism by which hospitals can prioritize and strategically plan for CDS implementation.